After use more than 10 browser, I feel GreenBrowser is the fastest browser, the best browser! This is an outstanding web browser. It's a lot like Maxthon and Slim Browser in many ways. For example, it offers tabbed browsing, plenty of security features (ad blocking, site blocking, and so on) as well as a ton of configuration options. I've found, though, that GreenBrowser is actually a bit faster than either Maxthon or Slim Browser or -- for that matter -- just about any other tabbed browser I've tried. So, the coding in GreenBrowser must be very tight, I would think (which is nice!). 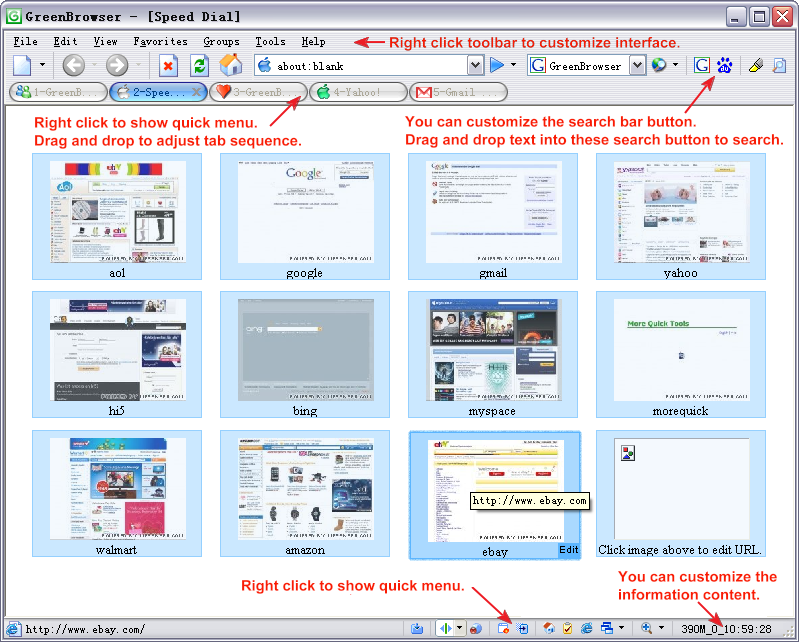 If you're looking for a tabbed browser, GreenBrowser is something you should try. During the last years, I spent 6 hours a day navigating in the net so I had the opportunity to prove many browsers (I would say almost all of them, except GreenBrowser of course) Some of them better than the others. But GreenBrowser is just the best of all. Really excellent! Very very well thought! It could fit all I wanted from a browser. You have forgotten practically nothing and this is much to say. Very recommendable! Congratulations! I am now using Greenbrowser, a very versatile and fast browser, giving users so many and very useful features, and in my experience the most easy to use so far among browsers I have experimented with; and it is packed into less than one meg of bytes -- plus it is free and not cluttered with ads. I have tried many browser based on Microsoft rendering engine, such as Crazy browser and Maxthon. But Green browser is The fastest one, it allocating The less of RAM, and i can use it with my screen reader. 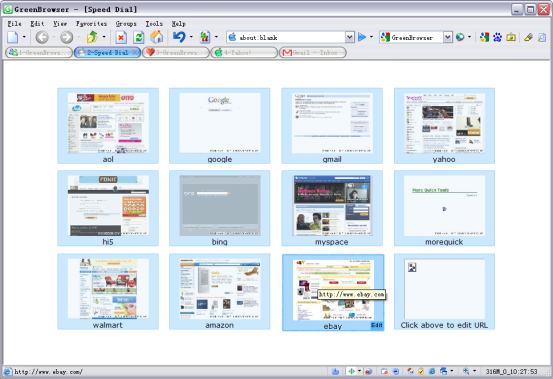 Never have I used a more configurable web browser! Other browser suppliers think people are too stupid to set up their browser the way they want---not so with Green Browser---it is GREAT! After researching and testing about every browser there is, i have come to the conclusion that greenbrowser is the best browser that exists. It is not only lightweight and extremely fast, but greenbrowser also does not hog all of your computer's memory or RAM. Also, with a small size of less than 3 megabytes, it can be installed on most computers without affecting their performance. Also, greenbrowser is bursting with options, and it also contains more features than chrome or firefox. Greenbrowser is sooo awsome!! Because we do not have enough time to translate GreenBrowser to other language editions, we invite you to help us to do this! Thanks for your support! Original GreenBrowser language file is English.ini under language catalogue of all language edition. From version 1.6, users can customize GreenBrowser's skin, and you can also customize almost all of the icons and backgrounds, you are welcome to give me your ideas and suggestions. Let's make reenBrowser more beautiful. Thanks for your support!